Refugees from South Sudan are transported from Elego town to the Numanzi Transit Center where meals and temporary accommodation are provided by UNHCR in Adjumani, northern Uganda. Some 26,500 South Sudanese, mostly women and children, have crossed into Uganda since fighting between rival forces erupted in and around the capital, Juba, on 7 July, the United Nations refugee agency reported today. Yesterday alone, an estimated 8,337 refugees crossed into Uganda, setting a single-day record since the influx began in 2016. “Thousands of people continue to flee uncertainty and fighting in South Sudan,” a spokesperson for the Office of the UN High Commissioner for Refugees (UNHCR), Andreas Needham, told reporters in Geneva, adding that more than 90 per cent of those are women and children. The influx is severely stretching the capacity of collection points, transit centres and reception centres, he said. On Wednesday night, more than 7,000 people slept at Elegu collection point, significantly beyond its 1,000-person capacity. Similarly, Kuluba collection point is hosting 1,099 refugees, compared to its 300-person capacity. Torrential rains are further hampering registration efforts, he added. Mr. Needham said that new arrivals in Adjumani reported that fighting was continuing between the Sudan People's Liberation Army (SPLA) loyal to President Salva Kiir and the SPLA in Opposition backing First Vice-President Riek Machar. There are reports from Magwi that armed gunmen continue to loot properties, forcibly recruit boys and young men, and murder civilians. Another Uganda People's Defense Force convoy evacuating Ugandan nationals from South Sudan is expected today, the spokespersons said, noting that on previous occasions, a large number of refugees have taken the opportunity to flee the country by accompanying the convoy. 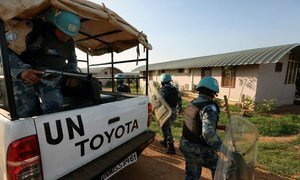 A thousand people today demonstrated in front of a United Nations compound in Juba, the capital of South Sudan, the UN Mission in the country announced, and dispersed without incidents after handing over a petition.